According to Rollins data from the graduating class of 2015, 75 percent of graduates are engaged in the workforce, grad school, or volunteer service 12 months after graduation. After 18 months, this figure rises to 81 percent. This data is the most recent information published by Center for Career & Life Planning (CCLP), which has taken strides toward increasing graduate employment. They have established tools and resources such as the student-faculty advising program called R-Compass, an online graduate survey, and the new Career Champions Mentor Program. Gilliean-Crump also explained that CCLP is encouraging earlier career preparation, whether that is by making connections with Rollins alumni, applying for graduate schools, or reaching out to potential employers. The data shows that 2015 was a benchmark year for the CCLP, said Gilliean-Crump. This was due to the merger of Career Services and Academic Internships in 2014. This merger coincided with a new approach to contacting and interacting with current and former Rollins students in order to get them more engaged about career opportunities. The introduction of the online survey by the CCLP made the survey a graduation requirement. This requirement made soon-to-be Rollins graduates take the survey more seriously, and it allows for the CCLP to gather more accurate data for their surveys. The Phone-A-Thon campaigns, for instance, are a new approach in which the CCLP contacts Rollins graduates and conducts their post-graduation surveys over the telephone. The Career Champions Mentor Program is another way in which students can still be attending school while making those important connections with successful alumni who can help them plan for the future, said Gilliean-Crump. This program had its pilot run last year, and 36 students applied for mentorship. The CCLP was able to match each of these students with an alum who worked in a similar field and carried a similar interest and passion. For example, Alumna Stacy Van Praagh (‘93), the President of the Americas at Alexander McQueen, was a mentor to Philip Denizard (‘16), who is now an assistant buyer at Gucci. The connection between student and alumni attests to the success of the Career Champions Mentor Program. Gilliean-Crump said that many of the students are still in contact and collaboration with their mentors. The CCLP is now emphasizing the importance of thinking about early career preparation. And the introduction of R-Compass, in particular, helps students connect with faculty who will advise them on how best to apply for jobs that they are most passionate about and that fit their major. Gilliean-Crump said the CCLP is also pushing for students to “develop LinkedIn accounts,” as they allow for students to be immersed in a community and truly “engaged in the process” of finding jobs. 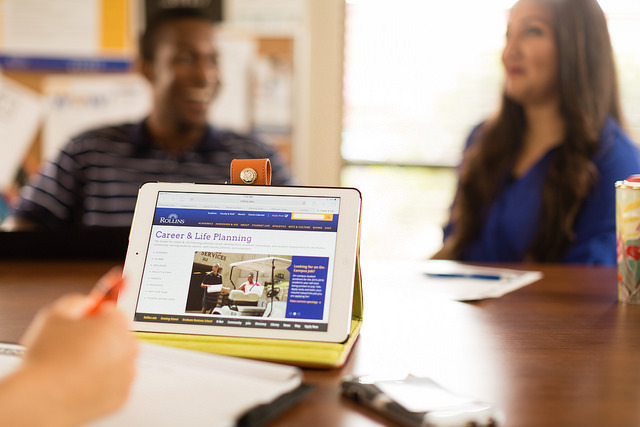 Students are also encouraged to refer to the Rollins Results page on the college website. It features the percentages of employed graduates and includes profiles focused on specific graduates becoming global citizens and responsible leaders.